Classic French in a lovely Tokyo home. 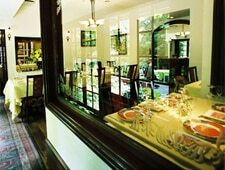 : This has long been considered one of Tokyo's top French restaurants. For many well-heeled families, it's been the place to celebrate milestones, enjoy a leisurely weekend lunch, and even offer or receive a wedding proposal. It operates out of one of Tokyo's prettiest houses---a modest Western-style villa with only a discreet sign and a man in coat and tails at the gate to mark the spot---right on the city's most prestigious residential street. And inside, you'll find walls lined with photos of smiling famous people, an old-fashioned lounge, and a series of small dining rooms that open onto a leafy courtyard that is also used for dining in the summer. Few restaurants can still boast of such quaintly elegant surroundings, especially when fine dining in this city has taken an ultra-modern turn. The food will enthrall as well, especially if you're looking for simple, classic cooking devoid of unrecognizable ingredients or fancy experimental techniques. The seasonal menu may include cold lobster cream soup, foie gras millefeuille, pan-fried fish seasoned only with salt and pepper, or a shoulder of pork roasted with garlic. There are few diversions from a recipe book that has been in use since the restaurant opened close to forty years ago, and this is exactly why loyal patrons keep coming back.